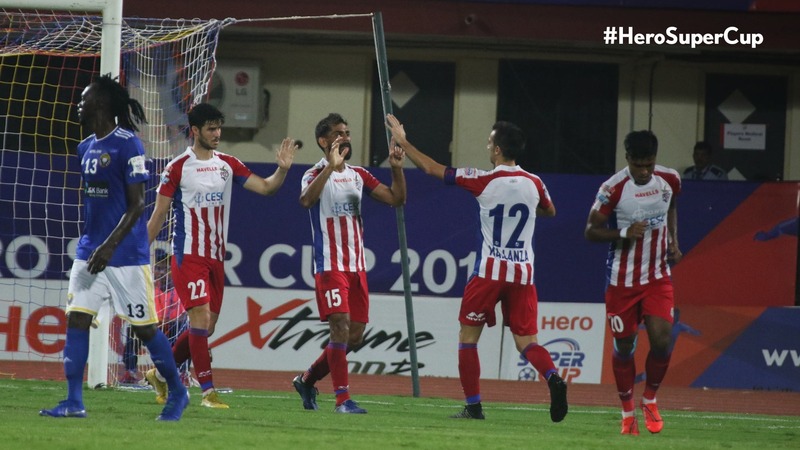 Super Cup 2019: ATK register comfortable win over Real Kashmir. It was the first meeting between a team from Kashmir with an ISL outfit. Bhubhaneshwar: ATK beat Real Kashmir by 3-1 to qualify to the next round in a pre-quarter final fixture played at the Kalinga Stadium here on Monday. Although they took lead in the game early,it took the Kolkata outfit two late goals to beat a sturdy Real Kashmir FC side.The victory sets up ATK for a quarter-final clash against Delhi Dynamos FC on April 5. ATK started the proceedings with a lot of purpose and almost broke the Real Kashmir defence with barely two minutes on the clock. Manuel Lanzarote played in Edu Garcia with a lovely waited through ball, but the Spaniard's final effort sailed over the bar. The ATK midfield seemed to be dominating the match early on, but Real Kashmir made sure they gave the Kolkata-based side a stern reminder of the danger they pose on the eighth minute. Completely against the flow of the match, Mason Robertson showed his own passing prowess, setting up Koffi Tetteh with room to run in behind the advanced ATK defence. With just Debjit Majumdar in the ATK goal to beat, the striker scuffed his shot wide. The chance, however, acted as a confidence booster of the I-League outfit as they started being a lot more adventurous from then on. Robertson was the central figure for the Snow Leopards, strutting forward at will and even drew a decent save from Debjit. Both sides traded a few half chances for till the half-time whistle, with ATK getting the better opportunities. But there was nothing to separate the two sides going into the break. The scoreboard read 1-1, with everything to play for in the second half. The second-half was a tightly bound affair with both teams trying their best to seize the initiative but failed to create any big chances in a match primarily dominated by two very well-drilled defences. Most of ATK's goal threats came through set pieces, while Real Kashmir looked to break forward and hit their opponents on the counter. Steve Coppell's spark of inspiration was, however, already on the field for ATK. It was none other than Lanzarote, who, time and again, has delivered for his team when they needed him the most. A corner kick routine straight off the training ground saw Edu pick out Lanzarote on the edge of the box. The Spaniard hit it first-time and placed the ball perfectly past Bilal to make it 2-1 on the 79th minute. Real Kashmir threw everything at the opposition in an effort to find a way back into the match, but a disciplined performance in the final minutes by ATK was enough to see off the Snow Leopards’ attack.